A successful building project starts with a reliable land survey. At Allpoints we achieve reliability through our dedication to customer service and attention to detail, supporting homebuilders across Texas. This is echoed throughout every stage of our process and with every team member, from the office to the field. Our customer-focused approach has resulted in minimized errors and dependability that our customers count on. 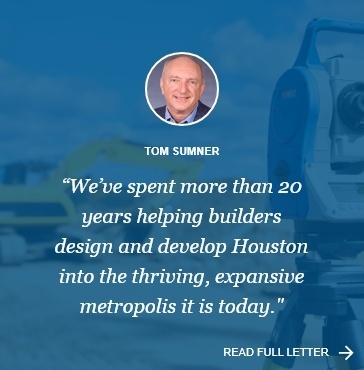 Here at Allpoints Surveying, we’ve spent more than 20 years helping builders design and develop Houston into the thriving, expansive metropolis it is today. What a blessing! Allpoints Surveying is the leader in providing high-quality survey services to meet our customers’ needs. We have become the clear choice among homebuilders due to our use of advanced technology and proprietary software, as well as our team members’ tradition of commitment to customer satisfaction. These days, we’re expanding our centralized services and advanced technology throughout the state of Texas. We are excited to bring our customer-focused approach and seamless, efficient services to new cities and developments. Our surveying program is specifically designed for homebuilders, offering a peace of mind that only comes with decades of experience and mastery. If a homebuilder does not feel that he is a surveyor's #1 priority, they need to talk to us. Homebuilders are our only customers and our only priority. While providing surveys for builders, we also participate in many industry projects and charities to promote the enjoyment of homes, neighborhoods, and the greater community. We want to thank the GHBA for its support and promotion of the homebuilding industry in the Houston area. We are honored to take part in the organization’s charitable endeavors, including the Associates Council. We are always in search of opportunities to give back to our communities. Surveying was part of the very building of this great nation. We’re proud to continue that time-honored tradition. Thank you for visiting our website and I wish you success in all of your endeavors. A Centralized Survey Process that Eliminates Headaches. Land surveying is a time-honored tradition. 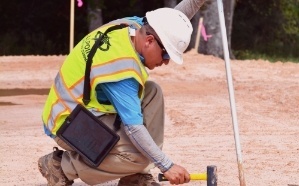 Advanced technology and our unique, centralized approach are bringing that tradition into the future by delivering reliable, cost-effective surveys in a matter of days. And we can prove it. Hear what our customers have to say about our fast turnaround. Surveying is a part of the foundation of America and so is giving back. At Allpoints we consider it our duty and privilege to work to improve our communities. We are honored to partner with these outstanding organizations.